I’m not completely convinced by the title or front cover of this book, by Jeanne Willis and Tony Ross. Whilst your curiosity is piqued by the image, combined with the title it seems too narrow a perspective on a book which has more to it than the cover suggests. Grill Pan Eddy is a maverick menace of a mouse. He can do virtually anything, and if there’s an opportunity to steal something, create mess or make something dirty, you can bet he’s there. The whole story of Grill Pan Eddy is told in rhyme, with occasional (and amusing) poetic licence to make things work. And his name was Grill Pan Eddy. In a crumpled cardboard beddy. The rhyme maintains fluidity and liveliness throughout, with a contemporary feel that works well for this particular text. 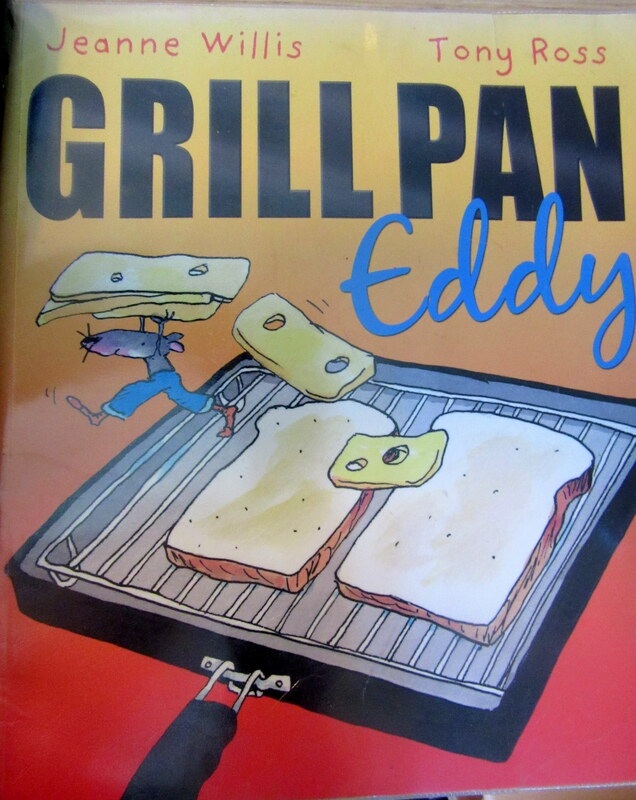 Grill Pan Eddy is a sort of punk-ish rebel, who “skied down the butter in his bovver boots / And sneezed in the snottage cheese.” The complex references and language, as well as the edgy content, mean that this is not a book for toddlers or preschoolers, but would make a good transition book for early readers in the first couple of years at primary school who are not yet ready for chapter books but who need a more grown up tone. 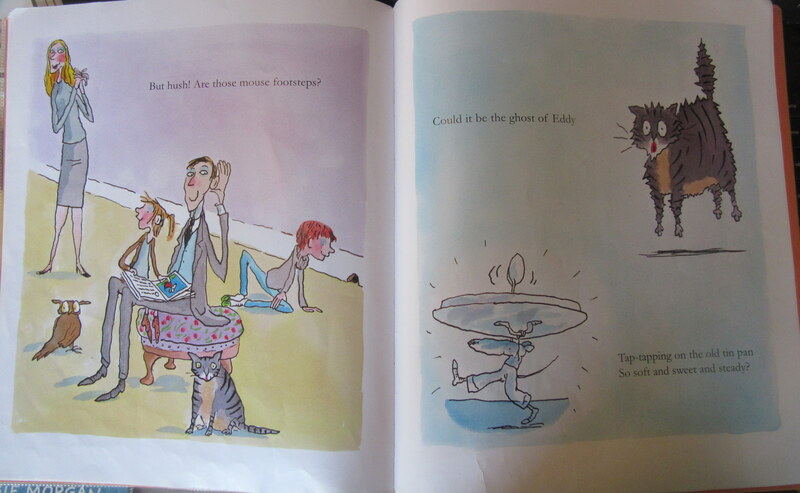 Not all of Eddy’s exploits are as funny as others, but Tony Ross’s illustrations keep both the drama and humour ticking along well. 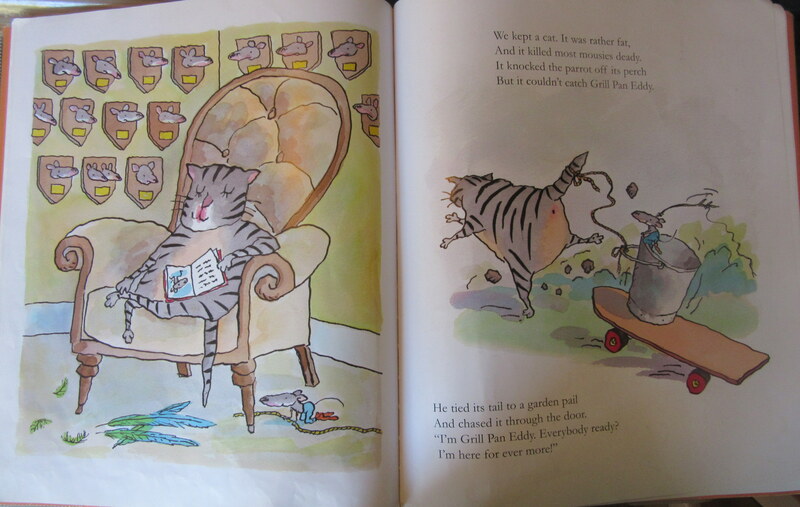 The strength and cunning of Eddy makes him an appealingly rebellious hero, expecially when he routs the cat despite his long history of mouse supremacy. What gives this book more depth than it might otherwise have is the fact that it is not just a story of getting rid of an annoying mouse, but about learning to enjoy his exploits and even become friends with him. In the end the family are quite attached to him, at which point (spoilers!) he sadly dies. 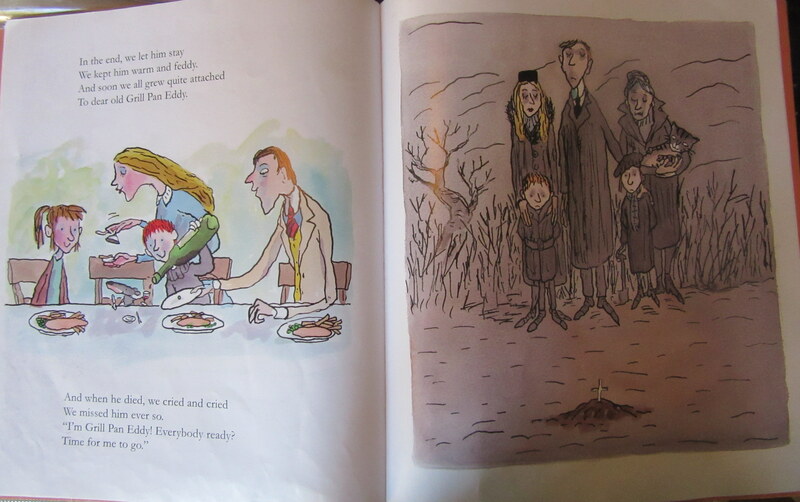 I love the miserable picture of the whole family mourning at the tiny grave; I think it’s beautifully pitched and works effectively as tragi-comedy. Of course they don’t leave the story there however, and with great control of her material Jeanne Willis teases out the final surprise with a subtle and enticing bit of writing. So soft and sweet and steady? I like this book. It’s good fun to read, and although I still think Grill Pan Eddy is not the greatest title in the world it’s worth ignoring that and reading the book itself. Tony Ross illustrations always have an anarchic feel to them and here that fits well with the tone of the story. Best for slightly older children, probably from Reception upwards.